So ended an 8 month tenure at Bradwell Bay, defending London and the South East of England from Luftwaffe raids coming from Continental Europe. In hindsight, of course, it is likely that this move was in anticipation of the planned invasion of Europe, and a tactical deployment of Night Fighters to protect the invasion and subsequent Allied advance. During their time at Bradwell Bay, the Squadron suffered the loss of 17 airmen. Their stories have already been told on this blog, and their names recorded in the Roll of Honour. 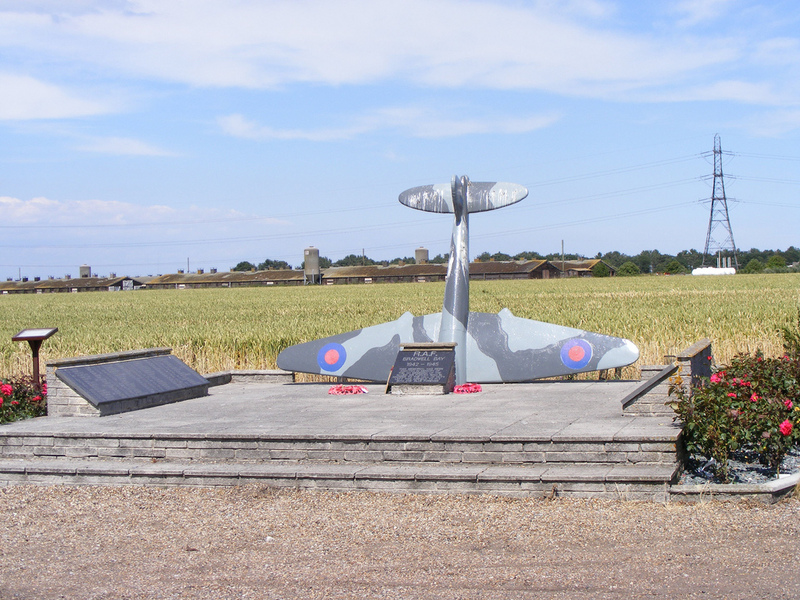 At what remains of the airfield today, there is a memorial to all those who lost their lives operating from the airfield. The names of 488’s 17 are recorded there. 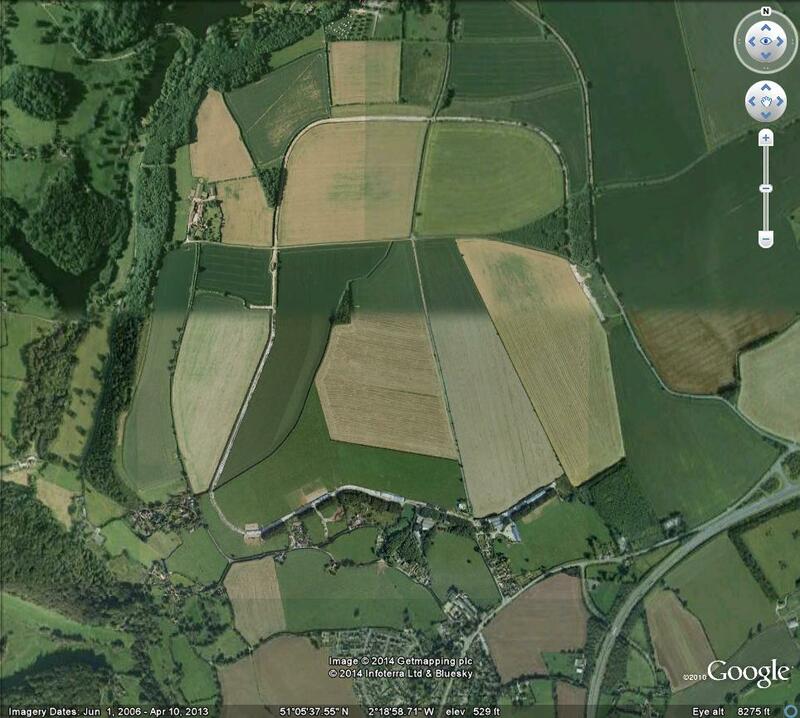 RAF Zeals is at Grid Reference ST 78018 32945, between the villages of Stourton and Mere, just off the A303. Not much remains of the airfield today – it has returned to agricultural use – apart from the old control tower which has been converted into a private residence. On the aerial phot below, you can still see the perimeter fence and some dispersal pans in the wooded area on the North East side. B Flight left for RAF Zeals on the morning of 4th, with A Flight (including Broody) remaining at Bradwell bay to maintain defensive flying. The main party moved by road in a convoy of 58 vehicles. The Squadron duly relocated to Colerne, some 25 miles to the North, where they remained for 7 days until moving back to Zeals on 11/v/44. Their last known position was off the North Foreland (near Ramsgate in Kent). The ORB later reported that there was “…no evidence available to account for the loss of this crew. A sad blow to ‘A’ Flight and to the Squadron”. The bodies of the Wilsons, both New Zealanders, were never recovered; and so their names are recorded on the RAF Memorial at Runnymede (Panel 263). Pilot as Navigator & Navigator as Pilot about half the way. Fairly hazy. On 07/iii/44, F/Sgt John Anderson, a New Zealand pilot arrived at the Squadron from 51 OTU where he had been trained on Beaufighters. On 11/iii/44 he was on only his second solo flight in a mosquito. On landing, he swung, tried to climb, and then dived into the ground after his undercarriage hit an obstruction. He was killed instantly. The subsequent report was critical of the fact that he had been posted direct to the squadron from an OTU but had no Mosquito experience. 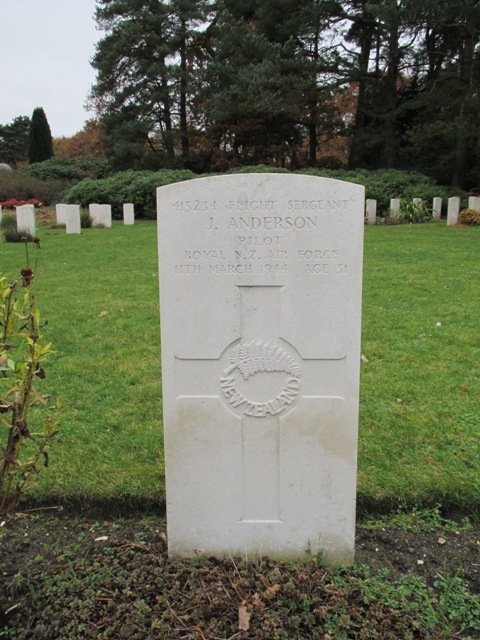 Anderson was buried at Brookwood Military Cemetery on the 15th March, with Squadron Representatives in attendance. 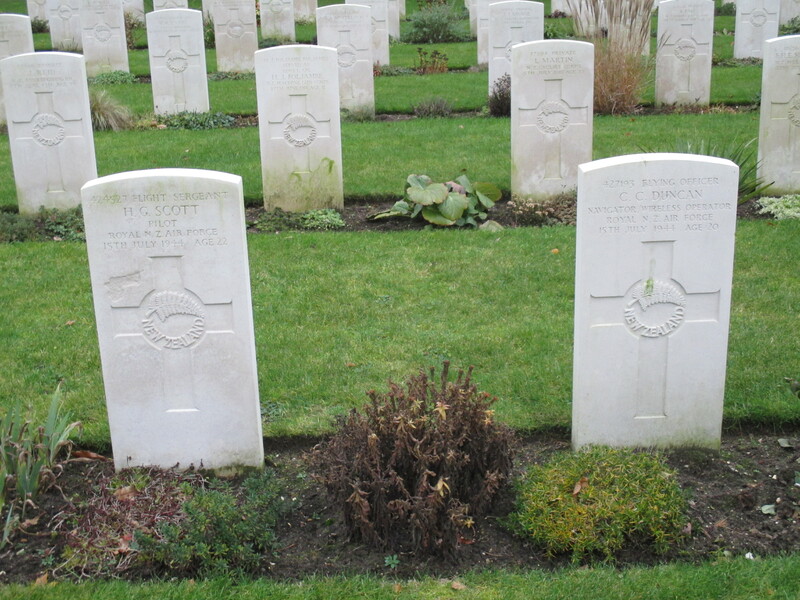 He lies in grave number 2.K.7, a short distance from his fellow Squadron members, Riwai, Clark, Watson & Edwards. His death brings the total number of lives lost since the start of Broody’s tour to 15. The grave of F/Sgt John Anderson. On the morning of 21st February, after the night time patrols had ended, a pre-dawn attack was identified and crews were scrambled to engage the enemy – several for the second time that night. 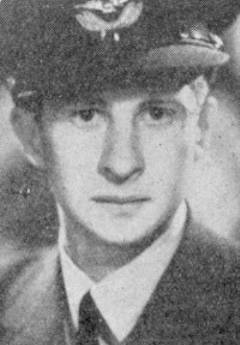 Amongst those who took off were Tohunga “Ricky” Riwai, the Squadron’s only Maori aircrew, and his navigator, Ian Clark. For reasons unknown, Ricky’s aircraft crashed into the steel anti-invasion defences beyond the airfield perimeter and both men were killed instantly. Leslie Hunt recalls how several individuals ignored the threat of the adjacent minefield and ran to give assistance to both men, albeit in vain. Riwai and Clark had only been posted to the Squadron 75 days before, but all the background information I have read about the Squadron shows the high regard in which this crew were held, especially Ricky who was an extremely popular member of the Squadron. Hunt said: “Words cannot express the feelings of the squadron after this tragedy – we had all come to regard Rick as one of the grandest types any of us have ever known, and with his shy but equally popular navigator, made a crew which we were confident would achieve great things” [Leslie Hunt – “Defence Until Dawn”]. 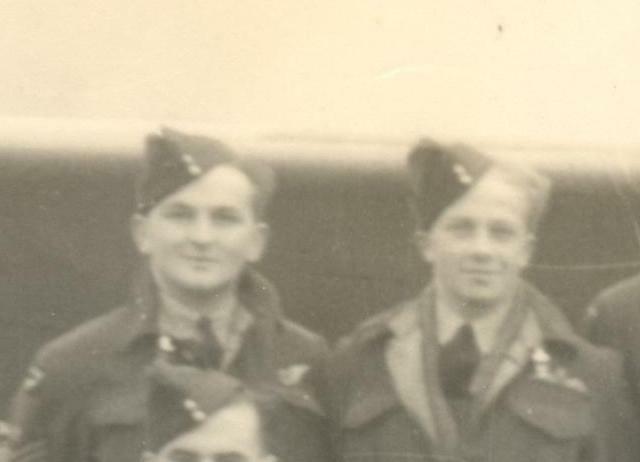 Riwai and Clark were in the squadron photograph taken some 3 weeks before their death. I think that Riwai, sitting on the front row in flying boots, with arms and legs crossed exudes a mass of confidence and self-assuredness! 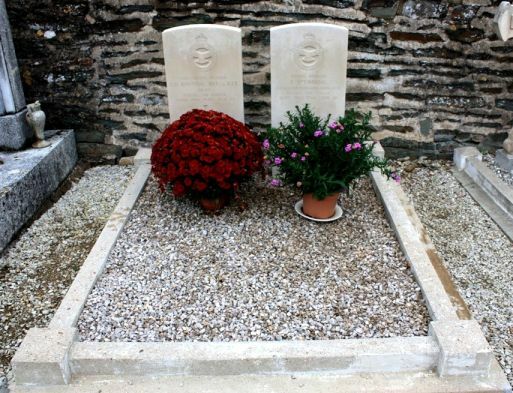 The graves of F/O Riwai & F/Sgt Clark. 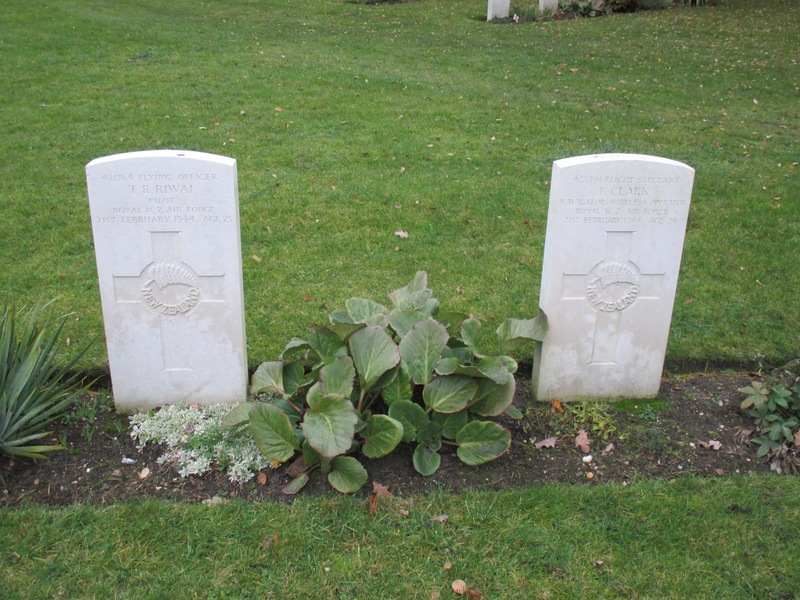 “Ricky” Riwai and Ian Clark were interred in the New Zealand Section of Brookwood Military Cemetery, next to the graves of their mates “Snowy” Watson and Ernest Edwards. The photo below shows the graves of 4 airmen of 488(NZ) squadron side by side – 4 brave Kiwis who came to England to fight for the freedom of the British Empire, and now lie many thousands of miles from home. The graves of F/O Riwai, F/Sgt Clark, F/Sgt Edwards & F/Sgt Watson. 4 Aircrew of 488(NZ) Squadron who were killed in February 1944. As part of my research for this blog, I visited Brookwood and gave my thanks to these men for their sacrifices so that I could bring up my children in a free world. With each loss I record, the more and more of the reality of war is revealed to me. I feel a sense of huge sadness each time an anniversary is reached, and cannot even begin to imagine how these losses impacted on the members of the squadron who survived each clash with the enemy as they saw their friends die. The loss of Riwai and Clark takes to 14 the total number of aircrew who have given their lives since the start of Broody’s tour in September 1943. Their names are duly recorded in the Roll of Honour. Just hours after these 2 young men were photographed side by side, they took to the air and died together. 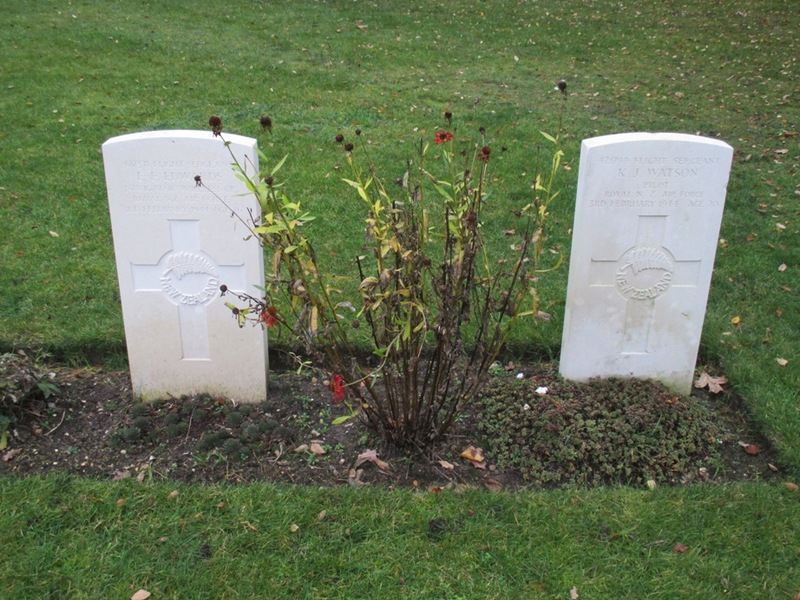 They were buried side by side in the New Zealand Section of Brookwood Military Cemetery. Only 3 days after returning from a Patrol with an engine fire, followed by a brake failure on landing, HK227 is back on Operational duties. This shows the effectiveness of the ground crews who must have worked every hour of the day to keep the Squadron’s aircraft flying! And so Broody’s war comes to an end for 1943. There is still much more to come! 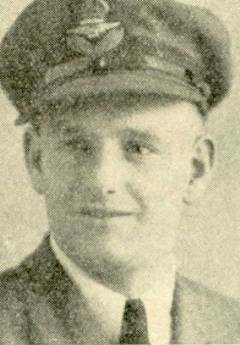 On 25/xi/43, S/Ldr Dudley Hobbis, the Commander of “A” Flight and his Navigator P/O Oliver Hills were killed when after their Port engine caught fire during a Patrol. Hobbis ordered Hills to bail out, and tried to nurse the damaged aircraft back to base. Unfortunately the Starboard engine also failed. The last radio message to control was from Hobbis who said he was also bailing out. Despite an Air Sea Rescue search, neither man was found, and were therefore presumed killed. The body of P/O Hills was found some eight months later, and he was laid to rest in Epsom Cemetery. The body of S/Ldr Hobbis was never recovered, and his name is recorded on the Runnymede Memorial. On 16/x/43, P/O Green and F/Sgt Creek were killed when their aircraft crashed into the River Blackwater near Bradwell Bay. P/O Green was buried in his hometown of Boston, Lincs on 22/x/43 with members of the Squadron in attendance. The body of F/Sgt Creek was never recovered, and his name is recorded on the Runnymede Memorial.